Panorama Cotton (パノラマコットン) is a 1994 shoot-'em-up for the Sega Mega Drive developed by Success and published by Sunsoft exclusively in Japan. Willows are special types of candies in a world of witches and fairies. Fairy Queen Velvet starts saying things that don't make sense, and the fairy Silk realizes it is because of monsters who are burning Willows (a burnt one was found near the castle garden). The witch Cotton, who loves eating Willows, conveniently shows up, learns of this, and vows revenge. 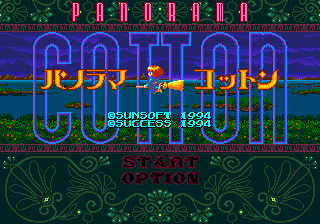 Unlike most other Cotton games, Panorama looks and plays like Space Harrier, where Cotton is following a fixed path and can only move around the screen using the D-pad. changes speed, fires, and uses a special Magic attack. It is the third game in the Cotton series of so-called "cute-'em-ups" for their unique visual style, and diverts from the gameplay of other Cotton titles. The release packaging included a promotional tea cup, which is now quite rare. Its method of gameplay would be reprised for the Dreamcast Rainbow Cotton. This is the only Japanese Sunsoft Mega Drive game that didn't came with "left-opening" box style. Main article: Panorama Cotton/Magazine articles.